Toronto is the most diverse city in the world, but looking at our City Council, you wouldn’t know this. Out of 45 elected officials, there are only 6 Councillors who are racialized, only 1 of whom is a racialized woman, and less than a third of Council are women. There are no black, indigenous, trans, or disabled women on Toronto City Council. Women Win Toronto is an organization dedicated to train and prepare women from diverse backgrounds (including trans and gender non-conforming individuals) to run winning campaigns in the 2018 municipal election. We believe that in order to build a fair and equitable city, we need political leaders that represent the diverse needs of all residents. 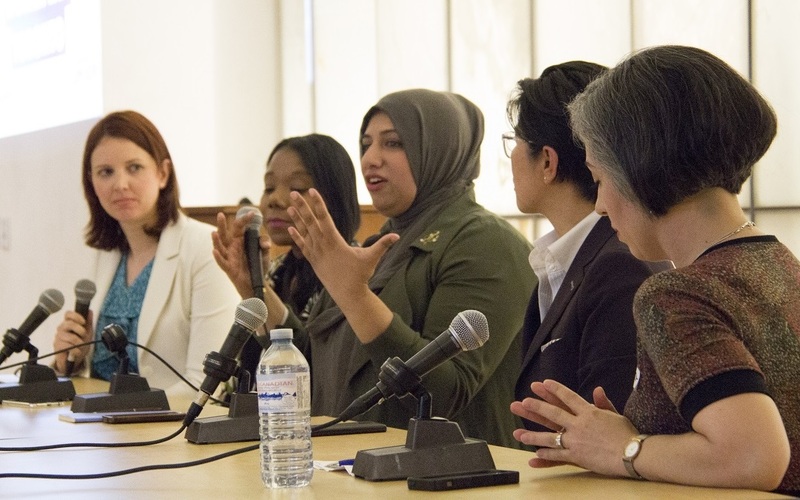 In May 2017, the Women Win Toronto launched its first-ever training program for women of diverse backgrounds to run winning campaigns in the 2018 municipal election. This series of workshops and training sessions walks through many aspects of running of winning campaign, including crafting a narrative, building a campaign team, and leading fundraising initiatives, stakeholder engagement, media and communications, and data management, and health and well-being on the campaign trail. Workshops and trainings are led by experts in the field – former candidates and campaign managers – who can give candid ins-and-outs of a campaign, which will prepare and increase the representation of racialized, indigenous, queer, disabled, and gender-diverse women. We want to celebrate and acknowledge the work of Equal Voice Canada and Toronto City Women’s Alliance, two organizations that encourage women to be in politics. Both informed our candidate training program. We are a team of committed volunteers who love working with each other towards this shared vision. We are looking for project managers, communications and social media experts, event organizers and general hands-on support. If you are interested in joining our team, email us! Our aim is to bring together women who are thinking about running for municipal office, and working together to build a more progressive and equitable city. We are leading a eight sessions to train participants about various aspects of managing a campaign. Workshops are led by experts who have experience as candidates, campaign managers and campaign directors. Sessions start in fall 2017.